Croissants… What do the Industrial Revolution, the Titanic, the Orient Express and Croissants, have in common?. . . . Steam, my friends, steam. . . .This magical and mighty energy is released when water reaches its boiling point. Steam has the power to move large industrial turbines, ships and train engines, and also to create flakey croissants. Thus, baking croissants involves having a knowledge of physics and thermodynamics. Hey kids, don’t skip those physics classes – you never know where life will take you: one day you could design a rocket, or. . . . hmmm. 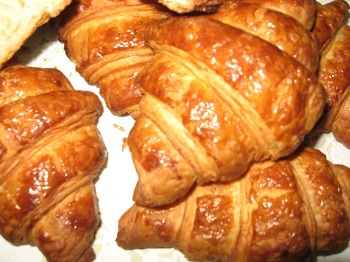 . . bake a fancy croissant which is considered to be the Holy Grail of French (Austrian) baking. While planning our trip to Paris, I had expressed my wish to spend time in a French ‘Boulangerie/Patisserie.’ Sharon and I fantasized that perhaps someone we knew, might know someone, who would know a baker, who would allow me to go behind the scenes in their bakery. As many of you know, I was on a quest for the ‘ flakiest croissant and the crustiest baguette in Paris…'(This turned out to be very difficult, because the gap between ‘very good’ and ‘excellent’ was almost non-existant). When I started the quest for the flakiest croissant, little did I know that it would end here at home in my own bakery. Since I returned from Paris, I’ve made two attempts at crafting the perfect croissant. The second attempt was yesterday, as some of you who sampled them know. It was far better than the first batch, but far from perfect. After all, practice make perfect, and exercise makes excellence. . . .
A while ago I invited my friend Chris to go on a ‘down to earth’ food adventure. Not only down to earth, but also down and dirty! For those of you who don’t know Chris Remington, he is the young, talented and modest chef who moved with his family from Vancouver a few years ago to take the helm at the Hooded Merganser Restaurant at the Lakeside Resort and Casino in Penticton BC. He has recently added a few more hours to his already busy schedule in order to oversee food operations for the whole resort. Anyways, as expected, he was all excited about the plan, which included mushroom foraging, and then cooking our bounty on the spot with the help of butter, garlic, thyme and of course, a white wine. The next step would have been to pile the fragrant fungi on a thick slice of country bread, close our eyes and enjoy the sounds of the forest and the noise of our chewing. This divine plan was missing a minor detail which proved to be a major one: neither Chris nor I had any practical field experience with mushrooms, so we were strongly advised not to attempt to recognize edible mushrooms from their pictures in a book! Well, Chris, this story is for you. . .
Rue Montorgueil is an eclectic street in the 2nd Arrondisement in Paris, which is a ‘foodie’s paradise,’ not only full of fabulous food shops, but also places like Dehillerin for cooking and baking equipment. 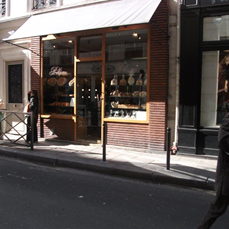 We started at Eric Kayser’s Boulangerie to pick up a half-loaf of his famous Pain du Compagne. Next door was a vegetable store with an amazing display of mushrooms including, Chanterelles, Trumpets, Girolles, and many others. My plan was immediately hatched: that night we would be eating mushrooms! With two hundred grams of Chanterelles at E20. a kilo (Cdn.$30) in our bag, we continued next door to the herb emporium, where we discovered every fresh herb imaginable, including the perfect fragrant bouquet of thyme, still attached to its roots, and covered in soil. 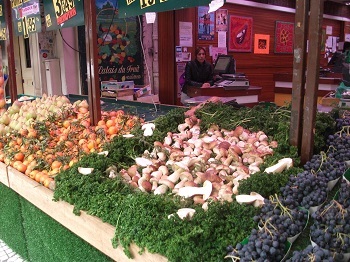 We also threw in a fresh head of garlic and some baby greens for a salad, and headed over to the ‘Fromagerie,’ which we could smell from down the street. Inside, it was pristine, esthetically beautiful, and had a wonderfully rustic feel. I almost expected to see a cow emerging from behind the counter. The refrigerated cases were full of a huge array of different cheeses, some displaying thick layers of blue and black mold that would make even the toughest Canadian food inspector shiver, knees weak, and question the sanity of his profession. While Sharon got all excited about the different fresh, soft, and very smelly Chevres, I opted for a Vieux Comte, a flavourful hard cheese. Behind the ‘cheese man,’ I noticed two blocks of butter sold by weight, so we included a nice slab with our purchase. For dessert we found a very decadent Napoleon at Boulangerie de Monge – it had three layers of puff pastry filled with a caramel pastry creme, topped with a dusting of almond pralines. We hopped on the Metro and home we went, back to Neuilly-sur-Seine where we were staying with Sharon’s friend. I headed straight to the small kitchen, sauteed the mushrooms in the fresh butter, garlic and thyme, and at the end de-glazed the pan with white wine. In another pan I whipped up a quick frittata using leftover potatoes and some of the moldy cheeses we’d bought. The salad was ready, the country bread was sliced, we poured some wine, and our dual-fungus-feast began. . . Chris, it was truly a down-to-earth shopping and eating experience. You would have loved it. As we grow older, we tend to find refuge in our childhood memories that are often associated with parent’s love, joy and comfort. One of the most exciting events during my childhood days in Romania was the circus’ visit in our small town. The only other event that came close in terms of wander and magic was the fair, but that’s for another story. I remember being fascinated by the Circus’ magic atmosphere displayed by the acrobats that were performing breath taking acts at high altitude, exotic wild animals, flame eater, knife thrower, the magician that would “slice” the poor lady in three equal parts and somehow reattach her successfully, funny clowns, the music and especially – the smell of the sawdust that covered the arena’s floor. In fact, I was so attracted to the Circus’ life, that around age of 6 I was considering leaving home and join the ever wandering Circus. Today, the only event that could deliver the magic punch would consider being Cirque du Soleil, and we’ve been able to see few of its shows. Since Sharon is quite familiar with my circus “fever,” she was very glad to announce that while doing research for our trip to Paris, she discovered that Cirque d’ Hiver has a permanent location there and she managed to reserve tickets! That was the moment when I truly started to get excited (aside from the thoughts of unlimited daily doses of buttery and flaky croissants, crusty baguettes with large holes and open crumb and other sins…). It was a nice summer afternoon and I was walking back home while holding hands with my grandfather. We were returning from the matinee show of the circus and I couldn’t have been happier. While humming to myself, grandpa asked: “Have I told you the story about the “Horse with no Name”? And without waiting for my reply, he continued: “Years ago, before you were born, your father owned a cart and few horses. He would work for a freight company hauling goods between towns. Sometimes he would go by himself or join a convoy and be away for few days. He had at least four horses and two would rest while he was away on a trip with the other couple of horses. He mentioned that he wanted to add another horse to his stable and was actively looking to do so. The day came, but when he returned with the new horse, he had an upset look on his face. When I inquired about it, he replied shortly: “He won’t pull the cart”! I went outside and there it was: a fine looking animal, muscular looking, with shiny skin, standing proud and taller than any other horse in the stable. At first glance, I couldn’t notice anything wrong with this magnificent creature but a second look showed that it was too “manicured” looking: the tail and mane were carefully braided. I asked: “Son, where did you find this horse?” – “At the circus, they were selling some of their horses at a very good price” – he said. “I bet they would” I said and started to laugh. I took a stick and started to rhythmically bang on an empty tin, and then it happened! The big creature leaned on its hind legs, lifted its front and started to step in the rhythm of the drumming. The scene was quite surreal and your father was gawking at the horse. I couldn’t stop laughing but II managed to shout: “Son, this isn’t a working horse – it’s a DANCINC horse”. The common practice those days was to “Baptize” a new horse. Following the first trip, and after forging a strong bond between the horse and its master, the horse is given a name and then officially joins the stable. Obviously, this wasn’t the case here and the horse was pompously returned to its former master at the circus.This was a first of many times I would hear the story of “The Horse with no Name” a.ka “The Dancing Horse”. This story isn’t really about Paris, the circus or a horse, but about my father who was a gentle and loving parent, who shaped me into the person I became. I wrote this story because his “Yahrzeit” (lighting a 24-hour candle on the anniversary of someone’s death) is taking place this week. From a young age my mother told me: “Money is not everything in life; the most important thing is to be a Mensch!” I almost instantly understood about money and its magical power that could turn a piece of old printed paper into chocolate candies covered in gold paper, or allowed me to go to the Great Circus that often visited our town. As for the meaning of Mensch, my mother promised that when I grew up, I would understand. You’ve heard the expression that a picture can paint a thousand words, but for those of you who are not familiar with the Yiddish language – a word can paint ten pictures. Later in life, true to her word, I encountered situations that taught me about being a Mensch: opportunities for good deeds, generosity, kindness, integrity, morality, taking responsibility, defending the weak, fighting for what’s right, and many other little things that would make my life and others’, easier and enjoyable – or miserable. Later, I tried to pass on this wisdom to my children, only to realize they would have to discover it for themselves. Like my father, I had always loved working with my hands: for 6 years I maintained the fighter jets in the Israeli Air Force, then I worked in the technology sector, and finally owned a printing and packaging business. When we moved to the Okanagan, I realized I missed chewing on a good, crusty, crunchy bread with a soft, open and airy crumb inside that would be tasty enough to be eaten all by itself. I couldn’t find such a loaf anywhere in Penticton, so I set out to see if I could make one for myself, and my passion for baking was born. . . Many out of town customers tell me that in their larger urban centres (or even in smaller places on Vancouver Island), people line up at the local artisan baker to grab a loaf of crusty bread before it all disappears. 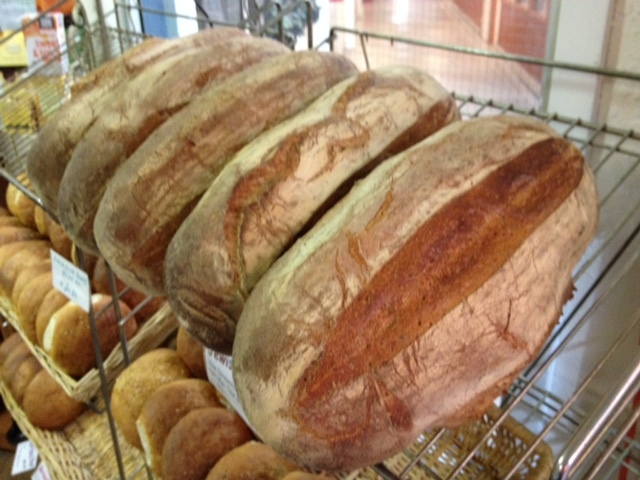 Sadly, I’ve been waiting for the folks in Penticton to discover the glory of eating fresh artisan bread. The French shop twice a day for a fresh baguette! For some reason, there aren’t many people here who share my love of that chewy crust and the flavour that artisan loaves are known for. I often jokingly tell my customers that I don’t know of any baker who drives a Mercedes. Let’s just say that I personally know of one who drives around in a ’93 Dodge Caravan with 440,128 km. on it. I have been asked several times about my culinary background, so here is the short-long story: The ‘slow food’ movement may have been created in Italy 20 years ago, but 30 years before that, in a small Romanian town in the province of Moldova, called ‘Falticeni,’ I had been born and raised in such a ‘slow’ culture. I was fortunate not to know of canned soup, boxed ‘Mac and Cheese,’ or any other processed foods. The term ‘organic’ hadn’t been coined yet, because everything was grown organically. The flowers were fragrant and the fruits and vegetables had real flavour; nothing was modified or altered. My mother apprenticed at my grandmother’s kitchen table, and together they baked bread, made their own egg pasta, cakes, pastries, Rugalach, borsht, stuffed tomatoes, peppers and vine leaves (with rice and ground beef), and many other amazing and mouth-watering dishes, which of course, as a child I often failed to appreciate. Nonetheless, at a deeper level, I did apprehend the seriousness and importance attributed to cooking and food. Everything was cooked on a coal-fired stove, baked in a wood-fired oven, created by hand from scratch, without the benefit of electric kitchen equipment. The only electric source was for lighting, and fresh water wasn’t available in the house. As soon as I could walk by myself and carry anything beyond my body’s mass, I was put in charge of carrying fresh drinking and cooking water in an enamel metal bucket, from a hand-cranked pump located at the end of our street. 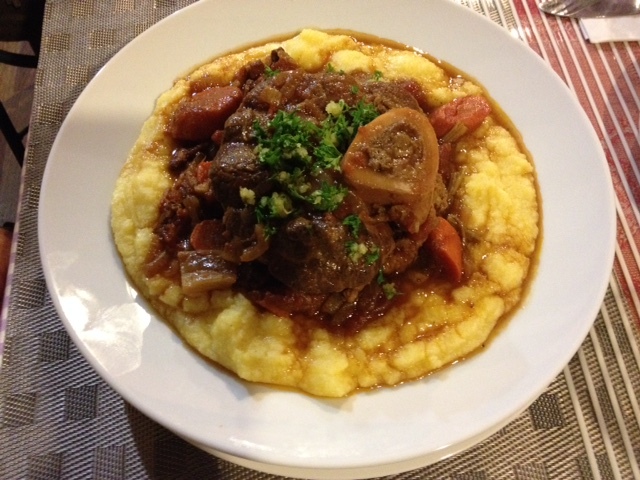 The Romanian culture has strong Italian and French influences in its spoken language and art, and its food is similar to the rustic cuisines of Tuscany and Provence. I still remember the vegetables in the ‘Givechi’ (Ratatouille) that were cooked individually in order to maintain their individual texture, and then assembled together so all the flavours could be absorbed The creamy, hot ‘Mamaliga’ (Polenta) was alternately layered with rich butter and a hard, sharp sheep’s cheese, creating a symphony of flavours. Any leftovers were baked and turned into croutons that were served with sweet milk for dinner. Nothing was wasted. As well, the once mighty Austro-Hungarian Empire left its mark on Romanian cuisine with the rich Goulash stew, the Viennese Schnitzel, and the amazingly multi-layered Dobos torte. The pinnacle of its legacy was the Viennese Strudel, whose pastry was stretched so thinly that you could actually read a newspaper through it. As a child, I was an active participant in food preparation, pitting cherries for making jams, cleaning the grapes for the wine, rolling pasta dough, patching-up holes in the Strudel pastry, etc. 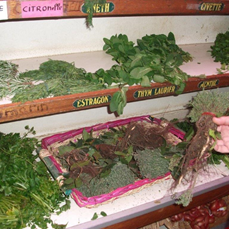 The shelves in the state-owned stores were always empty, and a thriving black market became the official food source. Farmers would bring their crop directly to people’s homes, and the strongest alliances were forged with the butcher and fishmonger. Meat was smoked, herrings were preserved in salt, pickles were made in large wine barrels, sherbets, comfitures, and jams were crafted, including a few ‘exotic’ ones like tomato, bitter black cherries, and red rose petals that tasted like a whole rose garden in your mouth; wine was fortified with sugar to age gracefully and turn into Brandy, raw milk was inoculated in order to make Kefir, buttermilk and yoghurt, and all remedies were made from vegetables and herbs. The attention to food was also extended to the meals themselves. These would be slow and long to allow for proper digestion. Meals were a time to gather the family around the table and to be joined together, in a spiritual fashion. It went beyond just feeding the family’s basic food needs; it was a labor of love, passion and dedication. Life was hard. Living under a totalitarian, communist dictatorship regime that alienated its citizens, took its toll on the population. Yet, paradoxically, the only thing that could kill you in those days was the regime’s dreaded secret police; the water, air and soil were clean, the food was healthy, and even in its hardship, life was simple and good. It was a time when men were real men, chivalry prevailed, and (almost) every man was a gentleman. This happened not so long ago, in a different era. I’m sure many of you carry similar fond memories. . . I know this Romantic époque cannot be revived today, but rural life in the beautiful Okanagan Valley, with its proximity to fresh food and wine-making has evoked many memories of my childhood, and inspired me to bring you some of my grandmother’s excellent recipes, in her rustic, unpretentious style, and in the warm spirit with which she imparted them to me. A whole new food chapter began in my life at age 9 when my family immigrated to Israel and I experienced the exotic tastes and smells of the Middle East and the Mediterranean!!! . . . To be continued. . .